Cornus controversa ‘Variegata’ commonly known as The Wedding Cake Tree is an upright, tiered deciduous tree with spreading branches. A relatively small and slow growing, graceful tree it makes a lovely focal point for any size of garden. With its bright green leaves and bold, creamy-white margins which dramatically turn red-purple in autumn. Cornus controversa Variegata produces an abundance of small white flowers from May to June borne in flat clusters. This is followed by blue-black berries in July, which are adored by birds. Even when all the leaves have fallen this still makes a pleasant tree to admire because of its interesting tiered look. Easy to grow and to care for, The Wedding Cake Tree is considered pest and disease free. 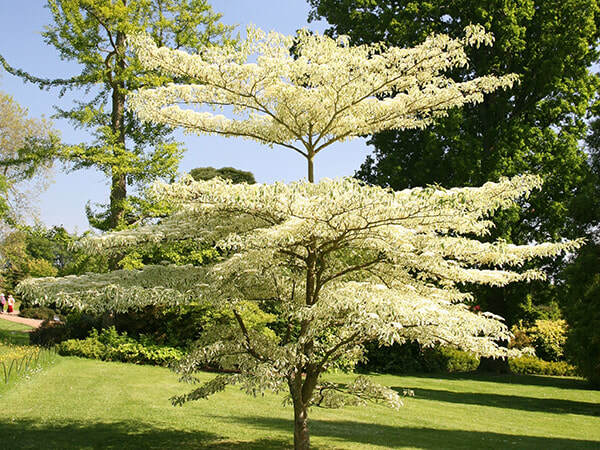 This Cornus variety is also the recipient of The Award of Garden Merit by Royal Horticultural Society, a sure sign of its outstanding performance in the garden. Fully hardy in the United Kingdom, Cornus controversa Variegata can survive even if the temperatures drop to 15 degrees below zero. As it is frost hardy, this highly decorative cultivar won’t need sheltering during the winter months. The Wedding Cake Tree grows well in a range of soil types so long as it is fertile and drainage is good. A spot in dappled shade or full sun gets the best from this unique small tree. Grown as a specimen tree in a prominent position, the striking, layered form of Cornus controversa Variegata offers both architectural and aesthetic value and elegance to any landscape.